I’m delighted to announce that Souvlaki For The Soul is raising their glass to celebrate the 50th birthday of that Aussie icon – cask wine. When I was asked to photograph and come up with some recipe suggestions, I was a little hesitant. Not because I’m a wine snob or anything. I’ve always held the view that wine is a personal choice. And let’s not get started on the red or white war! (red for me personally!). My memories of cask wine are a little fuzzy but I do remember watching those very camp ads in the 70’s on TV. Long haired women in maxi dresses, sipping cask wine whilst enjoying a “posh” cheese platter at a picnic! Who would have known that this clever invention by Thomas Angove in 1965 would lead to an industry which helps support 60,000 jobs across 64 wine producing regions in Australia. I was also surprised to find out that many winemakers have dedicated resources to produce wine solely for the cask. And that the majority of the packaging used to produce cask wine is recyclable. I know that our European cousins love their cask wine but my fellow Aussies have been shying away from this very convenient product. I’m all for supporting our wine industry. And I’ve come up with some food suggestions for a few local brands. There’s also a retro recipe to help you get in the mood. Long live the 70’s! The De Bortoli Premium Reserve Shiraz would be fantastic served with a cheese platter. I like my cheese platters to contain a good, strong hard cheese, such as a Parmesan or cheddar, something soft like a triple cream Brie and something blue. The Yalumba Shiraz is my choice for a good, hearty stew or braise. A strong shiraz like this needs to meet its match with bolder, gutsier flavours found in these winter warming dishes. And Finally, I’ve paired the Brookland Valley Verse 1 Cabernet Merlot with my very retro steak Diane recipe! My taste buds agreed that the lighter Cab/Merlot blend complemented the rich Diane sauce perfectly. It was so much fun making this. You forget how the simplest things always taste the best. It’s really easy to throw in some staple pantry and fridge ingredients to come up with a tasty dish. And after a little consultation with the butcher I opted to use a NY cut steak as opposed to an eye fillet. The extra fat surrounding the steak, provided that “necessary” extra flavour. I’m loving that the weather is also cooling down a little now. This dish should provide that encouragement to get into the kitchen and get a little “retro”. Don’t forget to pour yourself a glass from the cask to make it complete! Scroll down to see more pics and the recipe. 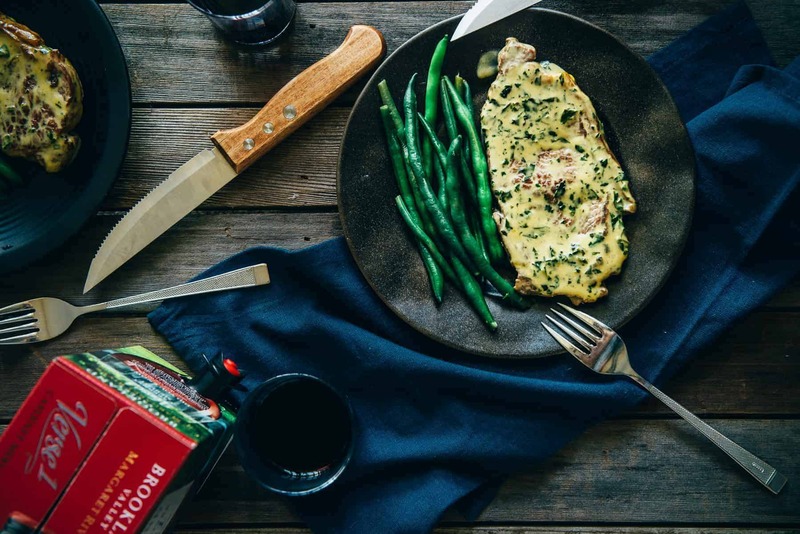 A classic steak Diane recipe made with NY cut steak, brandy, cream and Worcestershire sauce. A nostalgic, yet delicious step back in time. In the same pan you cooked the steak add the butter and allow to melt on a medium heat. Add the diced eschallots and fry for a few mins until translucent. Add the cream, brandy and Worcestershire sauce and allow the mixture to come to a quick boil. Add the parsley, salt and pepper, stir and place the steaks in the sauce to coat. Plate the steaks with extra sauce on a plate along with some green beans and serve immediately. This recipe is for one steak. Change it up according to the amount of steaks you are cooking.